Life Before the Dinosaurs: Amplectobelua. There are two species of Amplectobelua: Amplectobelua stephenensis and Amplectobelua symbrachiata. A. stephenensis was found in the Burgess Shale, and A. symbrachiata was found in the Chengjiang. This image shows Amplectobelua swimming with two Myllokunmingia and probably trying to eat them. 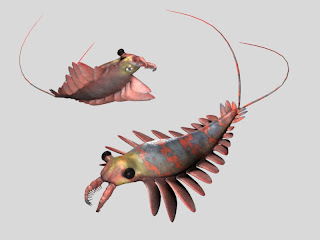 There are two main differences between Amplectobelua symbrachiata and Anomalocaris saron. 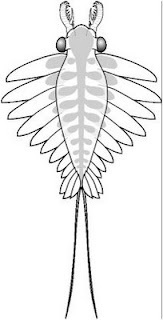 Amplectobelua symbrachiata had one huge spine in each claw, which Anomalocaris saron did not have. And Amplectobelua had its swimmers biggest in front and smallest at the back, which Anamolocaris saron did not have. Amplectobelua had two feeler-like cerci sticking out the posterior end. Complete fossils of Amplectobelua are rare. The most common pieces of Amplectobelua are the claws. Amplectobelua was a dinocarid, related to Anomalocaris, Opabinia, Kerygmachela, Pambdelurion, Sanctacaris, and Hurdia. Like Anomalocaris, Amplectobelua may have eaten trilobites, worms, and even other dinocarids. 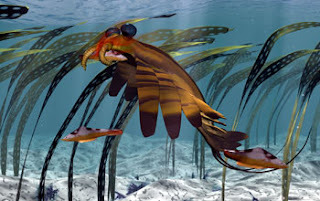 Love the Anomalocaridids (and relatives), they are some of my favourite animals, keep them coming.